The Old Testament reading for the Second Sunday in Lent falls within the section of Genesis beginning with “the generations of Isaac” in Genesis 25:19. Moses then briefly turns to Esau in 36:1 before finally focusing for a long time on Joseph. This section is mostly concerned with Jacob, even though it is named after Isaac. Even though Jacob will not die until the end of the book of Genesis, he recedes into the background after this point and is no longer the focus. Further, because his section is nearing its end, this is a high point for the story of Jacob. Throughout his whole section, he has struggled with men. It began in the womb with his brother Esau (Genesis 25:22-23). He struggled with Esau for his birthright (Genesis 25:29-34) and his blessing (Genesis 27). He struggled with Laban for his wives (Genesis 29:21-30), for his wages (Genesis 30:25-43), and finally for his family (Genesis 31:17-55). All of this has led up to this point. Jacob fled southward from Paddam-Aram in what is modern NE Syria, likely along the major trade road which passed through Damascus. After making peace with Laban in Gilead, Jacob goes to the river Jabbok, which moved counterclockwise before rushing down toward the Jordan. He left the road and followed the river, hoping to reach Canaan in the west. However, even though he has made peace with Laban, Jacob has to face the whole reason he fled northward in the first place: Esau. For all he knows, Esau is still seeking to kill him for stealing both his birthright and his blessing. Jacob does everything that he can to make amends and hopefully avoid the wrath of his brother. He sends everything he has, including his family, across the Jabbok at the best place to cross in the middle of the night. It was likely the early morning by the time it was done and Jacob was alone. Now, however, in the early hours of the morning, Jacob gets into a wrestling match with an unknown man. The verb translated “to wrestle” here (and this is the only place it occurs) draws a colorful picture: it is likely closely related to the noun for “dust.” Jacob is kicking up the dust in his fight with this man. 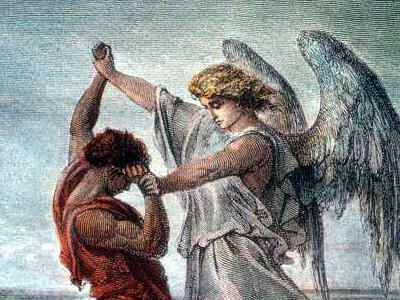 Jacob knows who his opponent is, however, because he demands a blessing from Him. Further, When it was all over, Jacob names the place Peniel (or Penuel, which means the same), literally the “face of God.” “I have seen God face to face, and yet my soul has been delivered.” It is true that he demands to know His name, but it pleased the Lord not to reveal everything to Jacob at that time. Just like when he appears to Manoah to announce the birth of Samson (Judges 13:17-18), He does not reveal His name. 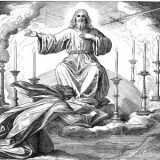 As He would tell Moses many years later, “I appeared to Abraham, to Isaac, and to Jacob as God Almighty, but by my name ‘The Lord’ I did not make myself known to them” (Exodus 6:3). The point is not to look for an answer to every question. The Lord does as it pleases Him. God gives Jacob a new name: Israel. Jacob, which means “Grabber,” has contended with men his whole life and now with God. Therefore, the Lord names him Israel, which means “he contends with God.” It is a fitting name for Jacob and also for his faithful sons, who would also contend with men and with God. Given a new name and blessed by God, Jacob now goes and reconciles with his brother Esau. Even though the custom Moses mentions in Genesis 32:32 finds its fulfillment in Jesus Christ, the lesson is the same for spiritual Israel. Physical Israel used it to remind themselves of what God had done for Jacob by delivering his life and giving him his new name. Spiritual Israel has similar things to call to mind God’s actions. Like the sinews of the hip, the Word proclaims what God has done.